Even though the theme for the year is “ken”, sensei speaks a lot about kaname, 要 (essential point, pivot) in his classes. Since the beginning of the year you can see on the right side of the shinden a calligraphy reading “jinryû no kaname wo mamoru” which can be approximately translated as “the main point of the heavenly dragon is protection”. 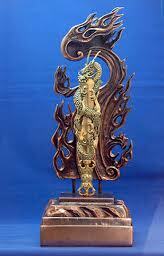 But maybe it makes more sense when you know how Fudô myô is represented symbolically: a chinese double edge sword with a vajra as a handle with a dragon wrapped around it. In the martial arts Fudô myô is a major deity protecting those walking on the path and bringing back on track those who are lost. Fudô is a protector, this is his kaname. The bujinkan teaches us to protect ourselves and the others. Last Sunday, sensei half joking said that the technique he was doing was coming directly from heaven and that there was nothing to do, only to let it flow through the body. This illustrates this concept of jinryû (神竜). During his last class, Senô sensei’s spoke a lot about the chûshin principle, 中心 (pivot) which is another translation for kaname. In a technique, he said, you have to include those pivots in your actions. By not grabbing the opponent but simply – and softly- guiding him you create pivoting points from which uke’s balance can be broken. Chûshin also has the meaning of “balance” or “focus”. Therefore by directing your “chûshin” (focus) on these “chûshin” (pivots), you break uke’s “chûshin” (balance). To use these pivots efficiently find them and rotate from the contact points without using any strength. It is as like dancing with your partner. When you dance you are in “chôwa”, 調和 (harmony), with uke. This harmonious way of moving is what seems to be the main aspect of today’s classes with sensei and the shihan in Japan. Being in harmony with uke you can resolve any situation. Going deeper in the harmony concept, Senô sensei said there are no techniques but only a permanent adaptation to the various tensions of uke, and this is the reason why not grabbing is important. When you grab uke with force, your grip prevents you from feeling uke’s tensions. For example when uke throws a punch, receive his attacking hand in a sort of berth (thumb inside, extended fingers outside) and pivot your hand with your body to open new angles. By pivoting with the whole body you create leverage (teko). Your thumb is the center (fulcrum) and the extended fingers the lever. If you try that you will find out that uke’s body not being stressed by strength (you are only receiving his hand in your hand) will follow the movement and open up. As you all know, “teko shiten” is one of the key principle of the Takagi Yôshin Ryû. Once uke’s balance is taken by this chûshin, you can bring him to the ground “harmoniously” with a simple sha ha ashi action of your leg. This off balancing by the leg is done with no strength at all and with the whole body. 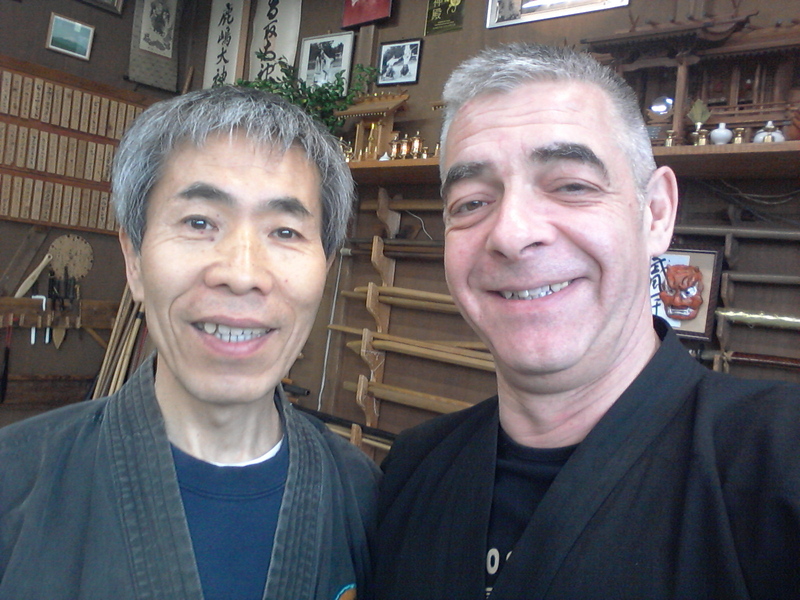 During this ovement, Senô sensei said “chikara janai” many times: “don’t use any force”. On the technical side, an efficient sha ha ashi, 斜八足, is done by pivoting on the toes of the foot, not the ball or the heel. * This toe pivot gives your body the proper distance needed. Because each uke moves differently you must adapt the distance and the technique. To be succesfull your actions have to be chiseled to the opponent’s body reactions. There is no shortcut to get that, and only through experience and years of training will you learn when to increase the distance or when to decrease it. Chôwa (harmony) between you and the attacker is important. Work on it. Often people ask how is it possible to do these techniques if no strength is used. Understand that strength can be used but only when the soft approach has failed. See this as a gear box in a car, as long as driving on fifth gear is fine it saves energy but if the traffic changes it might be necessary to retrograde your gears to have more power and control over your vehicle. Remember that the more energy you save, the longer you are able to survive. This goes for everything in life. If you keep your balance and take uke’s by using these soft pivots; if you can move in harmony with your opponent at all time, then strength is not needed. The concept of chûshin goes very well with the idea of kûkan. When Senô sensei was speaking about it I remembered the “kûkan no kyûsho” of the last daikomyô sai when sensei wanted us to find, or at least to be aware of, the weak point or the entry point of the empty space. Maybe can we see here the chûshin as being the kaname of kûkan.